Human mature erythrocytes are terminally differentiated cells that have lost their nuclei and organelles during development. Even though mature erythrocytes lack ribosomal and other large-sized RNAs, they still retain small-sized RNAs. We have recently shown that there are abundant and diverse species of microRNAs in mature erythrocytes through the use of several different techniques, including northern blot, miRNA microarray, and real-time PCR. Furthermore, fractionation and genomic analysis has revealed that erythrocyte microRNA expression is different from that of reticulocytes or leukocytes and that mature erythrocytes contribute the majority of microRNA expression in whole blood. Therefore, global analysis of microRNA expression in circulating erythrocytes has the potential to provide mechanistic insights into erythrocyte biology and erythrocyte-related disorders. 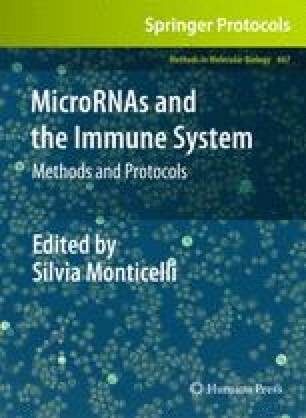 Here, we have provided the detailed methods for isolating and characterizing the microRNAs from human mature erythrocytes to enable such researches into human diseases involving erythrocytes. We thank the Duke microarray facility and members of the Chi lab for technical assistance and constructive feedback and the Telen lab for assistance with sample collection. This research was funded by NIH R21DK080994 and Roche Foundation for Anemia Research (RoFAR).